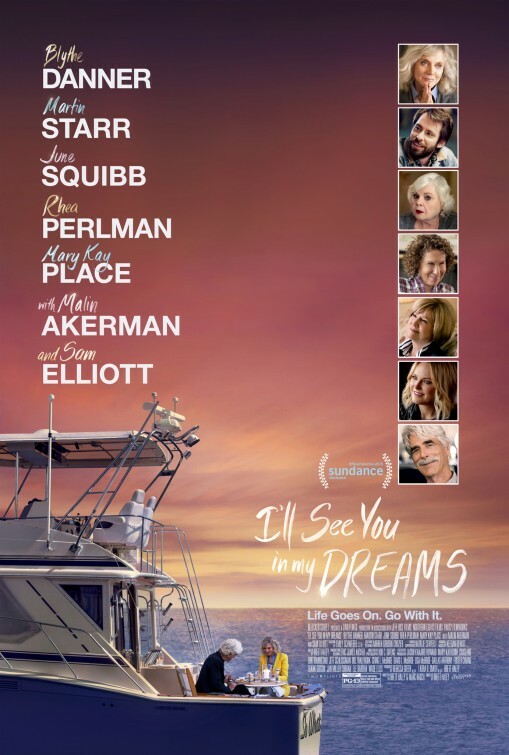 You hope that a movie like “I’ll See You in My Dreams” comes along each year. A movie that you take a chance on – one that becomes thoroughly pleasant and enjoyable as it unfolds. One that offers portrayals of real people, behaving honestly and naturally as they experience friendships and loss and contemplate who and where they are in life. For director and co-writer Brett Haley’ feature-length debut that may sound more deep than it actually is, but he’s written a screenplay, along with Marc Basch, that’s far from shallow. It’s actually quite an affective and heartfelt dramedy, one in which I surprisingly found myself interested in, connecting to it’s septuagenarian lead character and those she interacts with in a respectful and genuine manner. Anyone trepidatious about watching a movie that on the outside looks like “old folks movie”, should just allow themselves at least fifteen minutes to become won over. 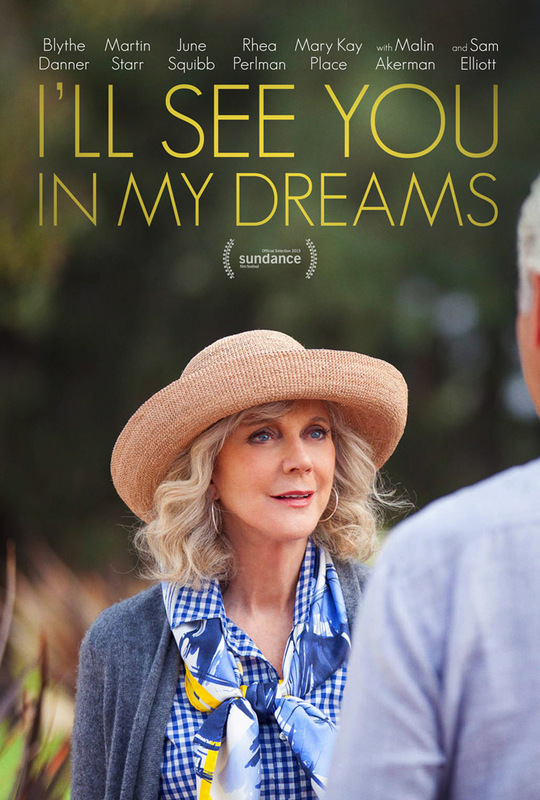 The film opens by showing us the daily routine of this a seventysomething widow named Carol (Blythe Danner), who lives a purposefully quiet Southern California life with her old dog, Hazel, who’s always by her side. Until one day, she’s not and Carol has to put her down. There’s a final goodbye moment at the animal hospital that turned me into a teary mess. What can I say? I’m a dog lover and I’ve been in Carol’s shoes before. From then on, I was hooked. With Hazel gone, a grief-stricken Carol slowly begins to look around her with new eyes. She strikes up a friendship with her thirtysomething pool cleaner, Lloyd (Martin Starr), simply seeking someone to talk to. She learns he’s an aspiring songwriter coasting through life without much meaning and he learns she was once a singer in a jazz band. One night the two go out to a local bar where Lloyd persuades Carol to sing karaoke. He breaks the ice with a hilarious rendition of “I Think We’re Alone Now”, while she wows Lloyd with a confident version of Arthur Hamilton’s “Cry Me a River”. Both actors are great at their singing turns – in context of their characters, of course. Don’t worry though, this isn’t turning into a “Harold and Maude” friendship. 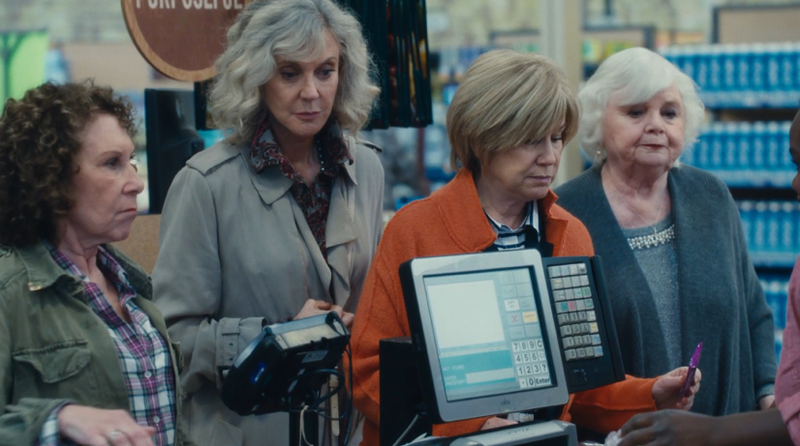 Carol still spends time with her cronies – Rona (Mary Kay Place), Sally (Rhea Perlman) and Georgina (June Squib) – who live at the nearby senior community. They sit around, playing cards and gossiping about who’s dating who or who just died, etc. All four of them partake in a hilariously awkward round of speed-dating (yes, that’s Max Gail from “Barney Miller”) and it turns out being as uncomfortable for Carol as you’d assume. Then Carol catches the attention of Bill (Sam Elliott) a smooth, cigar-chomping fella her age who also lives at the same facility as her pals. They start to see each other and soon it develops into something more, which surprises Carol – someone who had no inclination of starting up a serious relationship at her age. She’s so taken aback by this change in her life that even her visiting daughter, Katherine (Malin Ackerman), notices a difference in her mother’s disposition. Their relationship is a loving one, but hints at a strained history and there’s an indication that both her relationship with Bill and this visit by her daughter finds Carol questioning who she is somewhat – mother, widow, etc – leaving her to face her present and figure out what/who she should be. Like life, “I’ll See You In My Dreams” throws a few more zingers that we don’t expect. This is both relatable and bittersweet, since we grow attached to Danner’s Carol and want the best for her. This is credit to co-writers Haley and Basch. I find it amazing that such a thoroughly realized woman is written by two guys, but much credit goes to Danner, who has never been better. In fact, it’s kind of mind-blowing that at 71 years-old, this is her first lead role. She is comforting and delightful to watch here, almost like catching up with an old friend you never knew you had. What helps is no other character that she interacts with feel predictable or forced. Okay, maybe some of her friends, like the nosy one place by Mary Kay Place, but she nevertheless felt real – how many nosy friends do your grandparents have, after all? You get to the point in your life where the only thing going on in your life is what’s happening in your friend’s lives. Not that I’d know – yet. By far, the best interactions are between Danner and Elliott though. Elliott – who has had a banner year in supporting roles in “Digging For Fire“, “Grandma” and “The Good Dinosaur” – is excellent here. 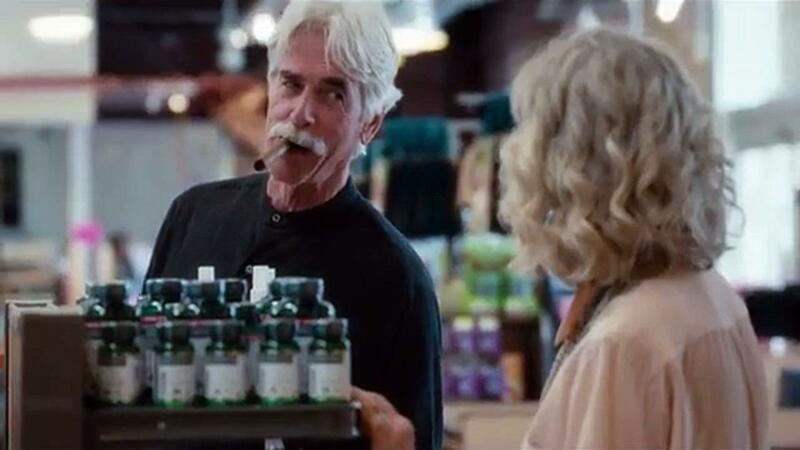 It’s easy to see how smitten Carol would be by Bill – because he’s played by Sam Elliott. Their scenes together are relaxed and fun to watch and just flat-out wonderful – in fact, he has one of my favorite character entrances of 2015. The other man in Carol’s life is great to watch too. Martin Starr has kind of a tricky character to portray, because we’re supposed to believe that Lloyd would be interested in having a platonic relationship with someone who could be his mother, or grandmother. He not only plays against his nerdy/awkward type, but embodies his character with an understandable need for a friendship with Carol as well as someone who would prove to be invaluable to Carol. It’s the kind of random, unplanned friendship we don’t see in this kind of movie – one that feels genuine without any pretenses. When I was a kid, I never dismissed certain movies as “old people movies”. I fondly recall the seniors in “Cocoon” and “Batteries Not Included” more than I did the sci-fi-hook which gravitated me to them and I specifically recall getting into “A Trip to Bountiful” in high school. I mention that just to bring up one reason this film may go overlooked. It shouldn’t. Regardless where these characters are in terms of gender, race or economic stance, they are relatable – they share the loneliness, longing, loss, fear and doubt that you and I feel, something that screenwriters Haley and Mark Basch understand and handle with confidence, humor and assurance.